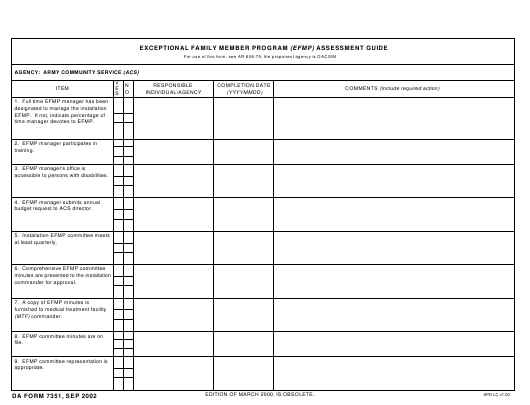 DA Form 7351 or the "Exceptional Family Member Program (efmp) Assessment Guide" is a Department of the Army-issued form used by and within the United States Military. The form - often incorrectly referred to as the DD form 7351 - was last revised on September 1, 2002. Download an up-to-date fillable DA Form 7351 down below in PDF-format or look it up on the Army Publishing Directorate website. time manager devotes to EFMP. budget request to ACS director. EDITION OF MARCH 2000, IS OBSOLETE. 11. SNRT membership is appropriate. operating procedure is on file. 13. EFMP roster is established. and civilian community support services. school officials and medical providers. 27. Respite care is provided for adults. for enrollment per para 3-1, AR 608-75.
an appropriate EFMP case coordinator. in concert with capabilities of local MTF. locations in the United States. providers outside the United States. in para 1-26, AR 608-75.